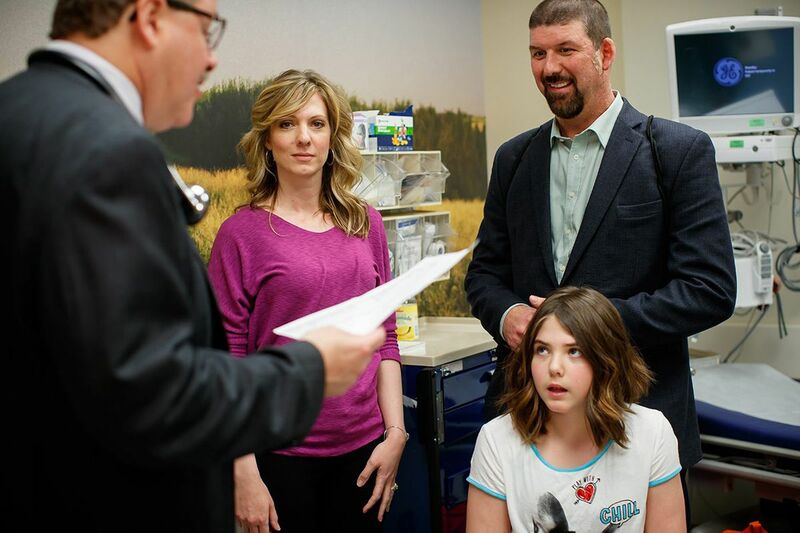 Dr. Stephan Grupp gives Emily Whitehead, and her parents, Tom and Kari, results confirming her cancer has remained in remission for more than five years during a patient visit to Children’s Hospital in May. For the estimated 600 children who battle terminal leukemia each year in the United States, there is new hope. And in the fledgling field of T-cell immune therapies, there is new excitement. In a resounding vote of confidence for a first-of-its-kind cancer treatment, a U.S. Food and Drug Administration advisory committee on Wednesday unanimously recommended approval of Novartis Pharmaceutical's T-cell therapy for acute lymphocytic leukemia (ALL). Novartis' technology, which genetically engineers each patient's immune system T-cells to recognize and attack cancer cells, was developed at the University of Pennsylvania by a team led by gene therapy pioneer Carl June. The leukemia therapy was clinically tested in studies at Children's Hospital of Philadelphia beginning in 2012, and in a pivotal study of 68 children at 25 medical centers around the world. The living drug, called tisagenlecleucel, has shown unparalleled effectiveness. It put 83 percent of patients in the global trial into complete remission, even though they had relapsed again and again with conventional treatments, according to Novartis' data. After six months, 75 percent of the patients who responded remained cancer-free. After infusion, the T cells go on an attack that overstimulates the child's immune system, triggering flu-like symptoms — or much worse. In the global trial, 82 percent of children had at least mild overstimulation, and 47 percent had life-threatening overreactions, such as high fevers, low blood pressure, seizures, liver abnormalities, and heart irregularities. No child has ever died of these side effects, but a frighteningly close call with the very first patient more than five years ago — Emily Whitehead of Philipsburg, Pa. — helped CHOP doctors develop the monitoring and response plan that includes use of an immune-dampening rheumatoid arthritis drug. Emily, now 12, attended the meeting at FDA offices in Silver Spring, Md., with her father, Tom. He assured the panel that those transient side effects, however scary, were a small price to pay for seeing his daughter beat a disease that was days away from killing her. "Our daughter was going to die, and now she leads a normal life," Whitehead told the panel, choking up. "We are honored to attend this hearing and be a part of this process." Another parent who testified, Don McMahon of Alpharetta, Ga., told how his son Connor, now 16, fought leukemia beginning at age 3. Last year, as Connor faced his third relapse, he qualified for the T-cell therapy at Duke University. "Connor … had fevers of over 104 for eight days," McMahon said. "But then he walked out of the hospital. He finished the hockey season. … For the sake of these children, approve this T-cell therapy." The 10 panel members praised Novartis for developing strategies to manage and minimize the risks. The company plans to limit to 35 the number of U.S. medical centers that will be allowed to offer the therapy and will provide intensive training of care providers, plus education for families. In addition, the company will create a registry to follow patients for up to 15 years, watching for possible rare, delayed side effects. One theoretical risk that has not been detected so far: secondary cancers could be caused by the viral vector that genetically modifies the T cells. "In the data presented today, the clinical responses are remarkable," said panel member Catherine Bollard, a pediatrician and immunologist at Children's National Medical Center in Washington. "I think Novartis has done a great job of mitigating the risks going forward." "This is a major advance and ushers in a new era of treatment of acute lymphocytic leukemia," said Malcolm Smith, a pediatric oncologist with the National Cancer Institute. The FDA is expected to follow the panel's advice and formally approve the therapy by this fall. Novartis, which is also seeking European approval of the leukemia therapy, is clearly in the lead in the high-stakes race to develop T-cell treatments, which are seen as an exciting new chapter in immunotherapy. Other companies, including Kite Pharma Inc. and Juno Therapeutics, are also developing such therapies for various blood malignancies. All hope the technology ultimately will work in solid tumor cancers, which pose more daunting obstacles than blood cancers. About 6,000 children and young adults are found to have ALL each year in the U.S. and Europe. About 85 percent are cured with conventional treatments, but those who repeatedly relapse face a grim prognosis, even with relentless rounds of highly toxic chemotherapy. "It's clear to all of us in oncology that, even though pediatric ALL is a success story, the patients who are left behind are in tough shape and really difficult to treat," Stephan Grupp, the CHOP oncologist who led the global trial, told the advisers. "It means hitting them with heavy chemo over and over. They spend weeks and months in the hospital. So the current treatment options are just not adequate." After the panel's unanimous endorsement, Grupp sounded elated. "This is the first engineered cell therapy in human history," he said. "It's been a decade of work with wonderful people at Penn. What could be better? This is a once-in-a-lifetime experience."